BLAIRSVILLE, Ga – Update – The Richard Russell Scenic Highway is the only road in Union County that was closed due to weather. It remains closed. FetchYourNews.com will update when this road is reopened. BLAIRSVILLE, Ga – Union County Schools will be closed again on Thursday, Jan. 18, due to hazardous road conditions, extremely low temperatures and the state of emergency issued by Gov. Nathan Deal. Government offices and businesses will be opening late on Thursday in Blairsville because of concerns about driver safety due to the probability of black ice on roadways in the early morning hours. Blairsville was brought to a standstill on Wednesday due to the weather. Some lesser traveled roads were, and still are, iced over, making travel extremely dangerous. 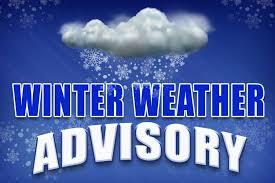 Here is the latest updated National Weather Service weather advisory. Fetch Your News is a hyper local news outlet that attracts more than 300,000 page views and 3.5 million impressions per month in Dawson, Lumpkin, White, Fannin, Gilmer, Pickens, Union, Towns and Murray counties as well as Cherokee County in N.C. FYNTV attracts approximately 15,000 viewers per week and reaches between 15,000 to 60,000 per week on our Facebook page. For the most effective, least expensive local advertising, call 706-276-6397 or email us at advertise@FetchYourNews.com.